Arborica, is the West Marin business of wood artisan Evan Shively. Not far from Tomales bay you find a landscape of salvaged logs and stacks of wood piled high. 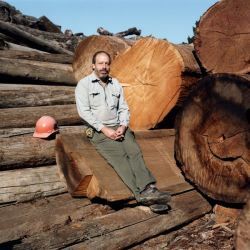 Shively, who was a chef for many years, started creating his unique wood furniture but found it difficult to find the wood he was looking for so he unwittingly became an expert at sourcing. He now has a lumber yard, mill, and showroom, which has become a valued resource for craftsmen and designers alike.